Pole length: 19.68" (500mm), makes it expandable to support 3 or 4 monitors. Quick mount & quick release designs at 3 connecting points: stand, spring arm and monitor end. 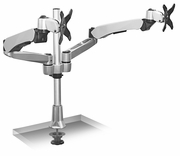 Supports two LCD monitors; Maximum adjustment rendered by tilting, swiveling, pivoting and dynamic height adjustment.